For the people that hadn't had time to prepare anything for Halloween or who are just invited to a Halloween party, I have a simple, last-minute Halloween look. 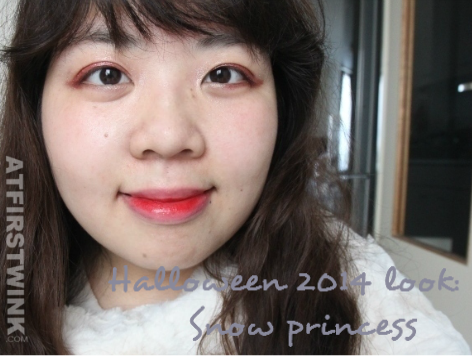 For this Snow princess look, I have used the same wine red eyeshadow as Elsa in Frozen, as it is the hottest trend in the snowy kingdom. ^_^ On my face, I am wearing the Etude House Princess Etoinette Crystal Powder that makes my skin look very white and with a hint of shimmer. It is making me look a bit too pale for normal days, but it is great for this occasion. My costume consists of a white, furry circle scarf that most people should have at home and a white dress. Keep reading to see what I products I used for the eyes and the lips. I first used the Clio gelpresso pencil gel liner in the color no. 6 - Bloody Sweet, spread out all over my eyelid and a bit outside of my inner eye corner. It is a pale pink eyeliner with multicolor shimmers, which makes it look warmer than a white shimmery eye shadow, but still very icy looking due to fine shimmers. Next, I used the Clio gelpresso pencil gel liner in the color no. 7 - Bloody Angel, as a smudged, winged eyeliner. It has a beautiful, shimmery wine red color. On the lips, I used the Peripera Kiss Tint 4 - Water Rose and the Aritaum Wannabe Cushion lip concealer - Clair on the outlines of my lips to make it look like I am freezing cold, but not near death. If you want a slightly scarier look, make sure to come back for the makeup look that I will be posting on my blog, later on: the vengeful snow ghost.